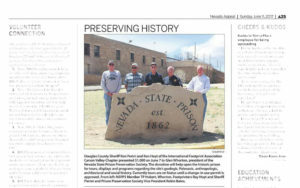 The June 2017 edition of the prestigious Nevada Magazine features a five-page article on the history of the NSP written by NSPPS Board Member Robin Bates. 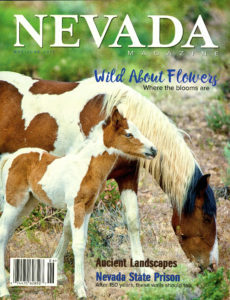 To subscribe to the Nevada Magazine click here. To read the article on-line, click here. Nevada Appeal, June 12, 2017: Douglas County Sheriff Ron Perini and Ron Hoyt of the International Footprint Association Carson Valley Chapter presented $1,000 on June 7 to Glen Whorton, president of the Nevada State Prison Preservation Society. 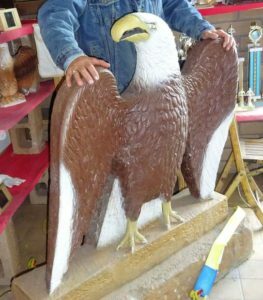 Nevada Appeal, November 26, 2016: After 96 years in private hands, the sandstone sculpture of an eagle that once graced the entrance of the old Nevada State Prison is back at the historic prison.